Do you know how to prevent hearing loss in your child? With the increased use of earbuds and headphones, and other noisy situations like mowing the lawn, parents can take steps to protect their child&apos;s hearing. Dr. Deepa Sekhar, assistant professor of pediatrics at Penn State Children&apos;s Hospital, offers advice. Description – The video begins inside a Penn State Health clinical observation room next to a window. Two individuals are standing together looking at the camera. From left to right is, Dr. Deepa Sekhar, assistant professor of pediatrics at Penn State Children™s Hospital and Scott Gilbert. Scott Gilbert – Welcome to Ask Us Anything About Hearing Loss in Children, I’m Scott Gilbert. A study in 2010 using data from the National Health and Nutrition Examination survey showed that one in five adolescents ages 12 to 19 has hearing loss. The problem is many parents are not talking to their children about this important topic and state-mandated hearing screenings often fail to detect, especially noise-related hearing loss. Here to talk with us today about this important topic is Dr. Deepa Sekhar, she’s a pediatrician at Penn State Children’s Hospital. Thanks a lot for being here Dr. Sekhar. I’d like to start with some of the biggest risk factors, the biggest causes for hearing loss in children. This may not be super straightforward because I understand it’s different in younger children than in older children, adolescents. Dr. Deepa Sekhar – So, Scott Thanks for having me. So, you are correct hearing loss varies by age. So, for our younger children typical causes or the big ones are ear infections which you can have fluid in the ear after an ear infection that will lead to hearing difficulty. However, for our older children it tends to be more noise exposure over time that can lead to problems with hearing loss. There are other causes meningitis, other more serious infections, but those tend to be some of the bigger ones. Scott Gilbert – I feel like so many children have ear infections when they’re young, both of mine did they had tubes. Does it ever cause long-term hearing loss or is it just for that short duration while the fluid is in there? Dr. Deepa Sekhar – So, in rare cases yes, it can cause long-term hearing loss, but in the majority of cases, it’s a short-term situation and often the tubes are placed to help drain the fluid so that the child is able to hear and not have repeated infections. Scott Gilbert – As we continue our discussion, we welcome your questions for Dr. Deepa Sekhar on the topic of hearing loss in children. Feel free to add them in the comment field below this Facebook post, we’ll pose them to her whether you ask the question live or even if it’s after the fact you’re watching this on playback, we can track down an answer for you and we’ll add that in the comment section. Also of course, feel free to share this post on your Facebook page to get this important information out there. Now I have to ask when we talk about older children, all of our kids wear earphones whether they’re those Beats or the over-the-ear headphones or even earbuds. What advice do you have for parents along those lines when it comes to choosing the right pair of headphones? Is it kind of tough advice to kind of narrow down? Dr. Deepa Sekhar – So, this one is tricky and I’ll actually point you to an article that came out in Times back in December of this past year [ Children™s Headphones May Carry Risk of Hearing Loss: http://nyti.ms/2uiShUB ] because there are a whole bunch of products marketed to parents at this point in time as noise canceling or hearing protecting headphones. But the fact is that they’re not strictly regulated by anybody at this point in time. So many of the products probably don’t do exactly what they say they’re going to do or will only do it if used in a very particular way. Scott Gilbert – So that term noise canceling does not indicate any special type of certification or anything like that? Dr. Deepa Sekhar – Yeah and in fact, we should probably say it™s less noise canceling than noise limiting they’re marketed to hold the volume usually, you know, at 85 decibels as the max. Keep in mind this was the standard sort of created for workplace noise exposure which you know has been used to market the headphones, but workplace noise exposure happens in an open area usually, so it’s not necessarily directly translatable. Scott Gilbert – Something I find interesting, a lot of people may not realize is part of the reason it’s hard to talk about the or narrow down the exact damage caused by sound heard in headphones is the way your ears respond to it may be different than mine and that goes back to genetics, right? Dr. Deepa Sekhar – So there’s several components that would affect an individual’s likelihood of having hearing damage. So, part of it relates to the volume of sound, the duration of exposure to the sound and then yes, there’s the genetic component. So, you and I listening at 50 decibels for eight hours it might be that only one of us would lose our hearing so that would be that genetic piece. But you know it’s hard to say at any given decibel level how long would be safe for an individual is a black-and-white answer. Scott Gilbert – Okay it’s different for each person it seems. What are some of the other most common causes we see, especially say in older children for high-frequency hearing loss? Dr. Deepa Sekhar – So a lot of exposures are things you see all the time, so kids listening to headphones and then not just listening to the headphones, but doing something that ups the background noise. So, if you’re mowing the lawn, you know, as your summer job and listening to your headphones you’re going to have to crank up that headphone volume pretty high to overcome the background noise of the mower. So, you already know that the headphones are on really loud. Concerts are another big place and you probably have seen a lot of celebrities who bring their young children to concerts have the headphones over them, other big sporting events are another source of noise exposure for children. Scott Gilbert – And what about sudden loud noises, such as gunshots while hunting? Dr. Deepa Sekhar – So right, so you make a really good point. So obviously when I go back to volume and duration of exposure, you know, we know that in some cases there are certain very loud noises that are going to be damaging to your hearing. So, if you’re standing right next to, you know, a gun that goes off when you’re hunting that can have an immediate impact on your hearing. Hunting becomes a tricky area because, you know, you want to protect your child’s hearing if hunting is an activity that your family does. Though in going to a hearing conference in Colorado several years ago, one of the big concerns brought up by parents was that they’re trying to give their children direction and they don’t want to muffle their hearing even though they appreciate that exposure to the gunshot noise is not safe. Scott Gilbert – You’re Watching Ask Us Anything About Hearing Loss in Children from Penn State Children’s Hospital, I’m Scott Gilbert along with Dr. Deepa Sekhar, she’s a pediatrician, but with a special interest both clinically and in research in hearing loss in children. So, this is a great chance for you to ask questions and get them answered right here whether it’s live or if you’re watching this video on playback, just drop the question in the comment field below this Facebook post. Let’s talk about some of that research, a lot of it focuses on the testing that happens in school. Every child at certain ages and certain grades goes through those hearing tests. What can you tell us about the effectiveness of those tests? Dr. Deepa Sekhar – So, the effectiveness is tricky and I’ve got to start out by saying our school nurses in Pennsylvania do a tremendous job of getting this hearing testing done every year. So, the state of Pennsylvania mandates hearing screening kindergarten through 3rd grade, 7th and 11th grade. The testing is done by pure tone audiometry, which means you put the headphones on and when you hear the tone you raise your hand. And the hearing screen that we have currently primarily targets lower frequencies of speech frequencies what would be affected if a younger child had an ear infection say and had some fluid left in the ear and was having difficulty hearing. Dr. Deepa Sekhar – I would say it’s less effective for our older children so for the 11th graders and that was the group that we looked at in our study who hopefully are not running around with an undiagnosed ear infection, but are more likely to have that noise-induced hearing loss which is typically in the higher frequencies which is not a standard part of the protocol. Scott Gilbert – Okay, so would the recommendation there then be to use perhaps test different frequencies at different ages? Dr. Deepa Sekhar – Exactly and that was the conclusion we came to after the work that we did. So, we had tested 134 students in a public high school and brought them back for, you know, repeat hearing testing and testing in a soundproof booth. But basically, what we determined was, you know, your standard protocol and I’ll say the American Academy of Pediatrics recommended protocol is a tad different than what we do in Pennsylvania. But the American Academy of Pediatrics protocol for example, had a 59% sensitivity for detecting hearing loss. So, if you had hearing loss I would test you with this protocol, I’d pick you up 59% of the time. When we added high frequencies, we got that sensitivity up to 79% which is significantly better. Now whenever you mess around with sensitivity specificity you basically, you know, end up getting more false positive results. So, we were able to though maintain a low number of false positive results by if you had a positive test we bring you back a second time. If you failed twice then you really are determined to have hearing loss. Hopefully I didn’t get too technical on you there. Scott Gilbert – No, no, no I think we followed you, we followed her right? 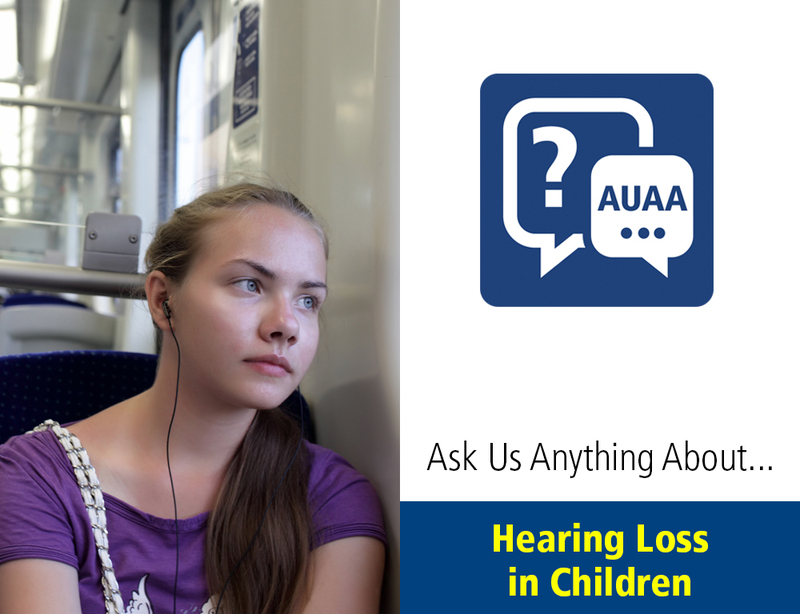 All right, feel free to ask your questions of Dr. Deepa Sekhar on Ask Us Anything About Hearing Loss in Children here from Penn State Children’s Hospital, some really great information. The other component of many of those hearing tests in school is outside of the headphones kids were asked a series of questions, what do those questions tend to center on? Dr. Deepa Sekhar – So as part of hearing screening in schools they are not typically questions that I’m aware of. There are some general questions posted on the CDC website though these were from my understanding mostly targeted towards older adults like do you have difficulty following the conversation if there’s a lot of background noise, do you have to turn the TV volume up. Too my knowledge they’ve never been formally validated in children as a way to pick out who might be at higher risk for hearing loss. In fact, Scott I will add that from what we know it seems that parents and children are pretty poor at self-report of hearing-related symptoms because hearing loss you don’t like wake up usually and just have boom really bad hearing loss overnight, especially for the noise related hearing loss. It’s insidious, it happens slowly as you continue to expose yourself, so you will adapt and compensate for a period of time. Scott Gilbert – And it’s a very gradual thing. So why is it so important to catch hearing loss early, so let’s say a teen is showing some signs of very low-grade hearing loss is that a major concern or could that point to problems later in life? Dr. Deepa Sekhar – So, it is a concern because we know that hearing loss causes academic difficulty, causes difficulty with social interactions which you know can affect your long-term promotion or productivity in the workplace and this is sort of supported by studies of older adults who have occupational noise-induced hearing loss that they found that they have these difficulties. And the other piece which you know from that one relative everybody has that can’t hear anybody and blames it on everybody else people usually, you know, don’t recognize that they have a hearing difficulty or don’t want to think that that could be the issue. So, it is important to detect early because you can stop the exposure if you can identify it. Scott Gilbert – So even before that point then what can parents do to try to start this discussion with their children from a preventive standpoint just maybe share some of these tips with our kids? Dr. Deepa Sekhar – Sure, so as I mentioned at the beginning, we were talking about the noise limiting headphones and you know so there’s not great regulation in the industry about this. There was a study published in pediatrics several years ago looking at the infant noise machines and the fact that even they were emitting pretty loud noises. Scott Gilbert – The white noise? Dr. Deepa Sekhar – Yeah and that they should probably not be placed near the baby’s crib, near their head, but maybe across the room. Even a lot of the toys, every parent has these, the annoying birthday gift that somebody gives you that makes those loud noises. Scott Gilbert – Oh yeah, yeah. Dr. Deepa Sekhar – But they’re not regulated, so I don’t have a cut and dry what can parents do. I do think for your teenager that you’re maybe getting a set of headphones for setting some basic ground rules would be a good idea as in like don’t let your teenager fall asleep with those headphones or earbuds in and sleep all night with them turned on. There’s no reason to have that continuous noise exposure to the ear overnight while they’re sleeping. Don’t let your teen mow the lawn and listen to the headphones at the same time that’s a bad idea. In fact, a good pair of ear protecting muffs to block the noise, the background noise from the mower would be a better choice. Scott Gilbert – Because they may think that they’re doing a good thing by listening to music to block out the mower sound, but in fact exposing their ears to just as many decibels. Dr. Deepa Sekhar – Exactly, exactly. And then, you know, there’s always the recommendation for the earplugs and stuff at concerts. Again, that gets into other issues of acceptability and do they want to do that. But I think it’s important to be cognizant of the exposures and where you could intervene as like the sleeping and the mowing that I mentioned to you. Scott Gilbert – Because this is damage that’s not reversible is that correct, they’re those little hairs inside the ear and what do those little hairs in the ear do with regard to helping you hear and why is it bad when they’re damaged? Dr. Deepa Sekhar – So you have hair cells in your inner ear and their job is to help you process sound and hear sound and when they’re exposed to damaging sound, so they lie in a very smooth orderly pattern and they kind of fray and get crazy when they’re exposed to damaging sound. Now it seems they might have some ability to repair themselves, but continued exposure to the damaging sound basically kills them off and you lose your hearing in the area where the hair cells are damaged, which is usually tied to a specific frequency of hearing. Scott Gilbert – But again, a good conversation with your children about common sense, ways to avoid hearing loss that’s a good place to start? Dr. Deepa Sekhar – Yeah and in fact, continued conversations like this are really important because it’s hopefully going to push the needle on some regulation for products on a national level. Scott Gilbert – Very interesting stuff because those stats the one in five children between 12 and 19 that’s some startling stuff so all parents should take note. Dr. Deepa Sekhar – Agreed. Scott Gilbert – Dr. Deepa Sekhar, pediatrician at Penn State Children’s Hospital. Thanks very much for your time today. We welcome your questions for her even if you’re watching this video on playback you can add them to the comment field and we will track down answers for you. Thank you again for watching Ask Us Anything About Hearing Loss in Children from Penn State Health, I’m Scott Gilbert.